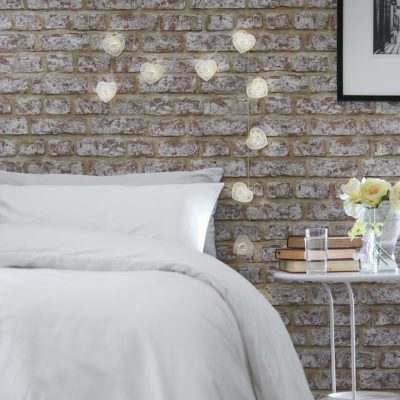 We’ve been getting some subtle signs that summer is just around the corner, so we thought this would be the best time to talk solar, and more specifically solar fairy lights! 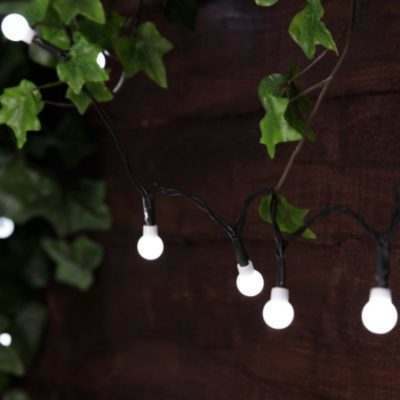 Now we know most of the time when you buy solar fairy lights you know exactly where you’re going to put them, but just in case you’re stuck in a rut, insistent on just throwing them over your biggest bushiest tree, we thought we’d give you some new ideas – 5 of them to be precise. Now I know I just implied this was a little unoriginal, but read on because it’s not just standard fairy lights that look good in trees. 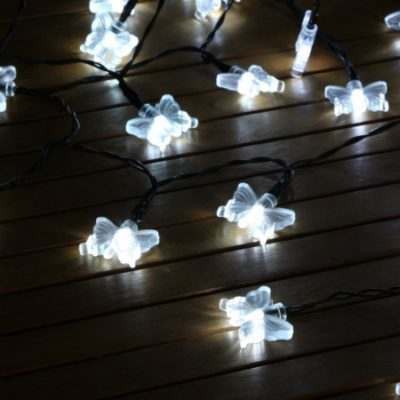 Lots of different types of fairy lights can look just as, if not more, amazing, whether it’s a butterfly cap, a festoon bulb or even a slightly more interesting berry cap. Each light will look amazing draped over the bushy exterior of a tree. But what about those ‘foliagely challenged’ trees? Not all trees come to life straight away in the summer, so if one of your trees is lacking a bit of colour, don’t overlook it, embrace it! 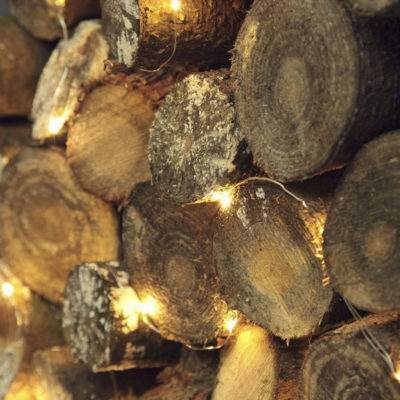 Make the most of those bare branches and start experimenting with wrapping the fairy lights round the twigs and trunk. Our top tip when structurally winding lights around a tree is to leave a little room, since, if you are planning on leaving them up through the year, the tree can tend to expand and retract throughout the seasons. So, during those long summer days, your parasol has become integral in keeping the sun out of your eyes, but what about those BBQs that run a little longer than expected? You still want a little bit of mood lighting but after a couple of beers and a pitcher of Pimms, do you want your guests around an open flame? 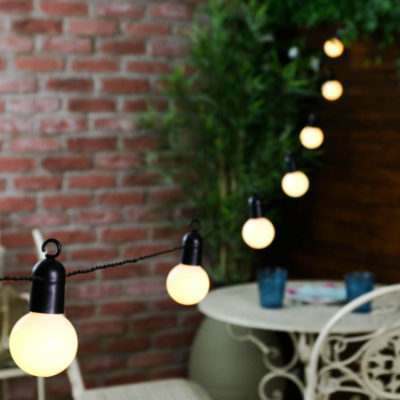 I didn’t think so, so why not hang your solar lights under your umbrella for perfect mood lighting that does not obscure your view or take up any vital paper plate and condiment space on your table. 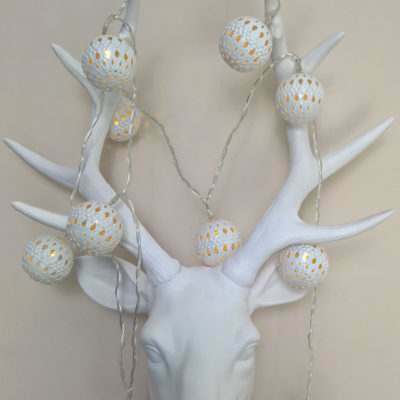 Our top tip for hanging lights under a parasol is to utilise the beams within when hanging your lights. Some people can’t help but think that hanging lights on the eaves of your roof is reserved for Christmas, but don’t be afraid to experiment. As long as you choose the right fairy lights, your home will be “beginning to look a lot like summer”, I mean you don’t see many dragonflies in winter now do you? If you’re still unsure, why not try hanging lights from the eaves of your shed first before you take the plunge. An old-y but a good-y, sometimes the simplest ideas can be the most effective. Draping lights over your bushes and plants is a great excuse to experiment with bulb caps and colours; we’re massive fans of hiding large festoon bulbs in bushes. 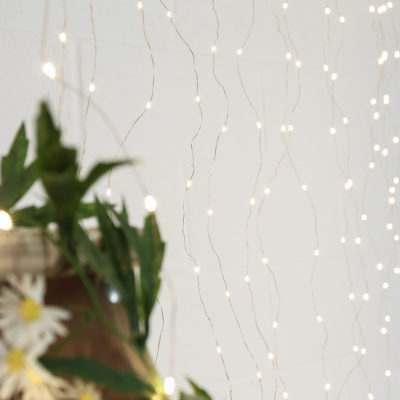 It also gives you a chance to be as strategic or as effortless as you like while draping your lights, as a well thought-out pattern or a natural fall of lights can both look stunning in your shrubbery. 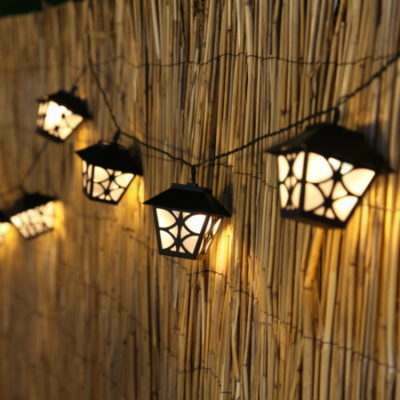 This idea is perfect for smaller gardens as it tends to make them look much bigger than they are, sometimes covering your foliage in lights can make a garden feel smaller at night, which, although cosy, can be annoying. Running lights along fences is a great way to experiment with shape and add depth to your garden, but don’t worry it still looks great in large gardens too. Our top tip for running lights along your fence is to use evenly spaced hooks to hang your lights for a more professional looking end product. We hope you enjoyed this blog post! Be sure to share if you think your friends might like it too.